2 Both low-born and high-born, Rich and poor together. 4 I will bend my ear to a parable: I will open my riddle on the harp. 6 [Even of] those who rely on their riches, And boast of their wealth? 9 That he may continue living on for ever, And may not see the pit. 10 Nay, he must see that the wise die The fool and the brutish perish alike, And leave to others their riches. 11 Their inward thought [is that] their houses [shall last] for ever, Their dwellings to generation after generation; They call their lands by their own names. 12 But man [being] in honour abides not: He becomes like the beasts [that] are brought to silence. 13 This is the lot of them to whom presumptuous confidence belongs: And after them men approve their sayings. Selah. 14 Like sheep they are folded in Sheol; Death shepherds them: And the upright shall rule over them in the morning; And their form shall be wasted away by Sheol, So that it is without a dwelling. 15 Surely God shall redeem my soul from the power of Sheol: For He shall take me. Selah. 17 For when he dies he will not take away any [of it]; His glory shall not go down after him. 19 He shall go to the generation of his fathers; For evermore they see not light. 20 Man [who is] in honour, and has not understanding, Becomes like the beasts that are brought to silence. This psalm touches the high-water mark of Old Testament faith in a future life; and in that respect, as well as in its application of that faith to alleviate the mystery of present inequalities and non-correspondence of desert with condition, is closely related to the noble Psalm lxxiii., with which it has also several verbal identities. Both have the same problem before them--to construct a theodicy, or "to vindicate the ways of God to man"--and both solve it in the same fashion. Both appear to refer to the story of Enoch in their remarkable expression for ultimate reception into the Divine presence. But whether the psalms are contemporaneous cannot be determined from these data. Cheyne regards the treatment of the theme in Psalm lxxiii. as "more skilful," and therefore presumably later than Psalm xlix., which he would place "somewhat before the close of the Persian period." This date rests on the assumption that the amount of certitude as to a future life expressed in the psalm was not realised in Israel till after the exile. After a solemn summons to all the world to hear the psalmist's utterance of what he has learned by Divine teaching (vv. 1-4), the psalm is divided into two parts, each closed with a refrain. The former of these (vv. 5-12) contrasts the arrogant security of the prosperous godless with the end that awaits them; while the second (vv. 13-20) contrasts the dreary lot of these victims of vain self-confidence with the blessed reception after death into God's own presence which the psalmist grasped as a certainty for himself, and thereon bases an exhortation to possess souls in patience while the godless prosper, and to be sure that their lofty structures will topple into hideous ruin. 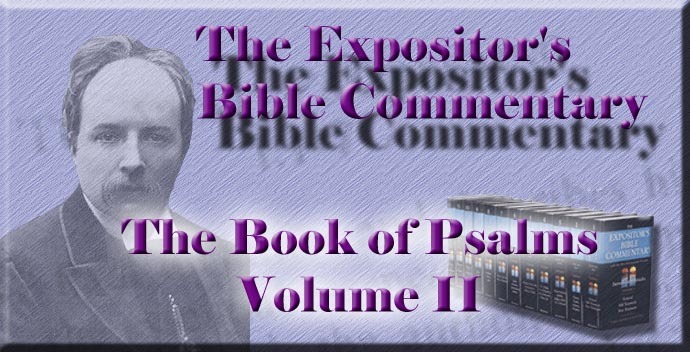 The psalmist's consciousness that he speaks by Divine inspiration, and that his message imports all men, is grandly expressed in his introductory summons. The very name which he gives to the world suggests the latter thought; for it means--the world considered as fleeting. Since we dwell in so transitory an abode, it becomes us to listen to the deep truths of the psalm. These have a message for high and low, for rich and poor. They are like a keen lancet to let out too great fulness of blood from the former, and to teach moderation, lowliness, and care for the Unseen. They are a calming draught for the latter, soothing when perplexed or harmed by "the proud man's contumely." But the psalmist calls for universal attention, not only because his lessons fit all classes, but because they are in themselves "wisdom," and because he himself had first bent his ear to receive them before he strung his lyre to utter them. The brother-psalmist, in Psalm lxxiii., presents himself as struggling with doubt and painfully groping his way to his conclusion. This psalmist presents himself as a divinely inspired teacher, who has received into purged and attentive ears; in many a whisper from God, and as the result of many an hour of silent waiting, the word which he would now proclaim on the housetops. The discipline of the teacher of religious truth is the same at all times. There must be the bent ear before there is the message which men will recognise as important and true. There is no parable in the ordinary sense in the psalm. The word seems to have acquired the wider meaning of a weighty didactic utterance, as in Psalm lxxviii. 2. The expression "Open my riddle" is ambiguous, and is by some understood to mean the proposal and by others the solution of the puzzle; but the phrase is more naturally understood of solving than of setting a riddle, and if so, the disproportion between the characters and fortunes of good and bad is the mystery or riddle, and the psalm is its solution. Death lays his icy hand on kings." Therefore how vain the boasting in wealth, when all its heaps cannot buy a day of life! This familiar thought is not all the psalmist's contribution to the solution of the mystery of life's unequal partition of worldly good; but it prepares the way for it, and it lays a foundation for his refusal to be afraid, however pressed by insolent enemies. Very significantly he sets the conclusion, to which observation of the transiency of human prosperity has led him, at the beginning of his "parable." In the parallel psalm (lxxiii.) the singer shows himself struggling from the depths of perplexity up to the sunny heights of faith. But here the poet begins with the clear utterance of trustful courage, and then vindicates it by the thought of the impotence of wealth to avert death. The hostility to himself of the self-confident rich boasters appears only for a moment at first. It is described by a gnarled, energetic phrase which has been diversely understood. But it seems clear that the "iniquity" (A.V. and R.V.) spoken of in ver. 5 b is not the psalmist's sin, for a reference here to his guilt or to retribution would be quite irrelevant; and if it were the consequences of his own evil that dogged him at his heels, he had every reason to fear, and confidence would be insolent defiance. But the word rendered in the A.V. heels, which is retained in the R.V. with a change in construction, may be a participial noun, derived from a verb meaning to trip up or supplant; and this gives a natural coherence to the whole verse, and connects it with the following one. "Pursuers" is a weak equivalent for the literal "those who would supplant me," but conveys the meaning, though in a somewhat enfeebled condition. Ver. 6 is a continuance of the description of the supplanters. They are "men of this world," the same type of man as excites stern disapproval in many psalms: as, for instance, in xvii. 14--a psalm which is closely related to this, both in its portrait of the godless and its lofty hope for the future. It is to be noted that they are not described as vicious or God-denying or defying. They are simply absorbed in the material, and believe that land and money are the real, solid goods. They are the same men as Jesus meant when He said that it was hard for those who trusted in riches to enter into the kingdom of heaven. It has been thought that the existence of such a class points to a late date for the psalm; but the reliance on riches does not require large riches to rely on, and may flourish in full perniciousness in very primitive social conditions. A small elevation suffices to lift a man high enough above his fellows to make a weak head giddy. Those to whom material possessions are the only good have a natural enmity towards those who find their wealth in truth and goodness. The poet, the thinker, and, most of all, the religious man, are targets for more or less active "malice," or, at all events, are recognised as belonging to another class, and regarded as singular and "unpractical," if nothing worse. But the psalmist looks far enough ahead to see the end of all the boasting, and points to the great instance of the impotence of material good--its powerlessness to prolong life. It would be more natural to find in ver. 7 the statement that the rich man cannot prolong his own days than that he cannot do so for a "brother." A very slight change in the text would make the initial word of the verse ("brother") the particle of asseveration, which occurs in ver. 15 (the direct antithesis of this verse), and is characteristic of the parallel Psalm lxxiii. With that reading (Ewald, Cheyne, Baethgen, etc.) other slight difficulties are smoothed; but the present text is attested by the LXX. and other early versions, and is capable of defence. It may be necessary to observe that there is no reference here to any other "redemption" than that of the body from physical death. There is a distinct intention to contrast the man's limited power with God's, for ver. 15 points back to this verse, and declares that God can do what man cannot. Ver. 8 must be taken as a parenthesis, and the construction carried on from ver. 7 to ver. 9, which specifies the purpose of the ransom, if it were possible. No man can secure for another continuous life or an escape from the necessity of seeing the pit--i.e., going down to the depths of death. It would cost more than all the rich man's store; wherefore he--the would-be ransomer--must abandon the attempt for ever. The "see" in ver. 10 is taken by many to have the same object as the "see" in ver. 9. "Yea, he shall see it." (So Hupfeld, Hitzig, Perowne, and others.) "The wise die" will then begin a new sentence. But the repetition is feeble, and breaks up the structure of ver. 10 undesirably. The fact stares the rich man in the face that no difference of position or of character affects the necessity of death. Down into that insatiable maw of Sheol ("the ever-asking"?) beauty, wisdom, wealth, folly, and animalism go alike, and it still gapes wide for fresh food. But a strange hallucination in the teeth of all experience is cherished in the "inward thought" of "the men of this world"--namely, that their houses shall continue for ever. Like the godless man in Psalm x., this rich man has reached a height of false security, which cannot be put into words without exposing its absurdity, but which yet haunts his inmost thoughts. The fond imagination of perpetuity is not driven out by the plain facts of life and death. He acts on the presumption of permanence; and he whose working hypothesis is that he is to abide always as his permanent home in his sumptuous palace, is rightly set down as believing in the incredible belief that the common lot will not be his. A man's real belief is that which moulds his life, though he has never formulated it in words. This "inward thought" either underlies the rich godless man's career, or that career is inexplicable. There is an emphatic contrast drawn between what he "sees" and what he, all the while, hugs in his secret heart. That contrast is lost if the emendation found in the LXX. and adopted by many modern commentators is accepted, according to which, by the transposition of a letter, we get "their grave" instead of "their inward [thought]." A reference to the grave comes too early; and if the sense of ver. 11 a is that "their grave (or, the graves) are their houses for ever," there is no parallelism between ver. 11 a and c. The delusion of continuance is, on the other hand, naturally connected with the proud attempt to make their names immortal by impressing them on their estates. The language of ver. 11 c is somewhat ambiguous; but, on the whole, the rendering "they call their lands by their own names" accords best with the context. Then comes with a crash the stern refrain which pulverises all this insanity of arrogance. The highest distinction among men gives no exemption from the grim law which holds all corporeal life in its gripe. The psalmist does not look, and probably did not see, beyond the external fact of death. He knows nothing of a future for the men whose portion is in this life. As we shall see in the second part of the psalm, the confidence in immortality is for him a deduction from the fact of communion with God here, and, apparently, his bent ear had received no whisper as to any distinction between the godless man and the beast in the regard to their deaths. They are alike "brought to silence." The awful dumbness of the dead strikes on his heart and imagination as most pathetic. "That skull had a tongue in it, and could sing once," and now the pale lips are locked in eternal silence, and some ears hunger in vain "for the sound of a voice that is still." Hupfeld would transfer ver. 13, which begins the second part, so that it should stand before the refrain, which would then have the Selah, that now comes in peculiarly at the end of ver. 13. But there is nothing unnatural in the first verse of the second part summing up the contents of the first part; and such a summary is needed in order to bring out the contrast between the godless folly and end of the rich men on the one hand, and the hope of the psalmist on the other. The construction of ver. 13 is disputed. The "way" may either mean conduct or fate, and the word rendered in the A.V. and R.V. "folly" has also the meaning of stupid security or self-confidence. It seems best to regard the sentence as not pronouncing again that the conduct described in vv. 6-11 is foolish, but that the end foretold in ver. 12 surely falls on such as have that dogged insensibility to the facts of life which issues in such presumptuous assurance. Many commentators would carry on the sentence into ver. 13 b, and extend the "lot" to those who in after-generations approve their sayings. But the paradoxical fact that notwithstanding each generation's experience the delusion is obstinately maintained from father to son yields a fuller meaning. In either case the notes of the musical interlude fix attention on the thought, in order to make the force of the following contrast greater. That contrast first deals with the fate of godless men after death. The comparison with the "beasts" in the refrain may have suggested the sombre grandeur of the metaphor in ver. 14 a and b: Sheol is as a great fold into which flocks are driven. There Death rules as the shepherd of that dim realm. What a contrast to the fold and the flock of the other Shepherd, who guides His unterrified sheep through the "valley of the shadow of death"! The waters of stillness beside which this sad shepherd makes his flock lie down are doleful and sluggish. There is no cheerful activity for these, nor any fair pastures, but they are penned in compelled inaction in that dreadful fold. So far the picture is comparatively clear, but with the next clause difficulties begin. Does the "morning" mean only the end of the night of trouble, the beginning in this life of the "upright's" deliverance, or have we here an eschatological utterance? The whole of the rest of the verse has to do with the unseen world, and to confine this clause to the temporal triumph of the righteous over their dead oppressors drags in an idea belonging to another sphere altogether. We venture to regard the interpretation of these enigmatical words, which sees in them a dim adumbration of a great morning which will yet stream its light into the land of darkness, and in which not this or that upright man but the class as a whole shall triumph, as the only one which keeps the parts of the verse in unity. It is part of the "riddle" of the psalmist, probably not perfectly explicable to himself. We cannot say that there is here the clear teaching of a resurrection, but there is the germ of it, whether distinctly apprehended by the singer or not. The first glimpses of truth in all regions are vague, and the gazer does not know that the star he sees is a sun. Not otherwise did the great truths of the future life rise on inspired men of old. This psalmist divined, or, more truly, heard in his bent ear, that Good and its lovers should triumph beyond the grave, and that somehow a morning would break for them. But he knew nothing of any such for the godless dead. And the remainder of the verse expresses in enigmatical brevity and obscurity the gloomy fate of those for whom there was no such awakening as he hoped for himself. Very different renderings have been given of the gnarled words. If we adhere to the accents, the literal translation is, "Their form is [destined] for the wasting of Sheol, from a dwelling-place for it," or "without its dwelling-place"--an obscure saying, which is, however, intelligible when rendered as above. It describes the wasting away of the whole man, not merely his corporeal form, in Sheol, of which the corruption of the body in the grave may stand as a terrible symbol, so that only a thin shred of personality remains, which wanders homeless, unclothed with any house either "of this tabernacle" or any other, and so found drearily naked. Homeless desolation of bare being, from which all that is fair or good has been gnawed away, is awfully expressed in the words. Other renderings, neglecting the accents and amending the text, bring out other meanings: such as "Their form is for corruption; Hades [will be] its dwelling-place" (Jennings and Lowe); "Their form shall waste away. Sheol shall be their castle for ever" (so Cheyne in "Book of Psalms"; in "Orig. of Psalt." frame is substituted for form, and palace for castle. Baethgen gives up the attempt to render the text or to restore it, and takes to asterisks). To this condition of dismal inactivity, as of sheep penned in a fold, of loss of beauty, of wasting and homelessness, the psalmist opposes the fate which he has risen to anticipate for himself. Ver. 15 is plainly antithetical, not only to ver. 14, but to ver. 7. The "redemption" which was impossible with men is possible with God. The emphatic particle of asseveration and restriction at the beginning is, as we have remarked, characteristic of the parallel Psalm lxiii. It here strengthens the expression of confidence, and points to God as alone able to deliver His servant from the "hand of Sheol." That deliverance is clearly not escape from the universal lot, which the psalmist has just proclaimed so impressively as affecting wise and foolish alike. But while he expects that he, too, will have to submit to the strong hand that plucks all men from their dwelling-places, he has won the assurance that sameness of outward lot covers absolute difference in the conditions of those who are subjected to it. The faith that he will be delivered from the power of Sheol does not necessarily imply the specific kind of deliverance involved in resurrection, and it may be a question whether that idea was definitely before the singer's mind. But, without dogmatising on that doubtful point, plainly his expectation was of a life beyond death, the antithesis of the cheerless one just painted in such gloomy colours. The very brevity of the second clause of the verse makes it the more emphatic. The same pregnant phrase occurs again with the same emphasis in Psalm lxxiii. 24, "Thou shalt take me," and in both passages the psalmist is obviously quoting from the narrative of Enoch's translation. "God took him" (Gen. v. 24). He has fed his faith on that signal instance of the end of a life of communion with God, and it has confirmed the hopes which such a life cannot but kindle, so that he is ready to submit to the common lot, bearing in his heart the assurance that, in experiencing it, he will not be driven by that grim shepherd into his gloomy fold, but lifted by God into His own presence. As in Psalms xvi. and xvii., we have here the certainty of immortality filling a devout soul as the result of present experience of communion with God. These great utterances as to the two contrasted conditions after death are, in one aspect, the psalmist's "riddle," in so far as they are stated in "dark and cloudy words," but, in another view, are the solution of the painful enigma of the prosperity of the godless and the afflictions of the righteous. Fittingly the Selah follows this solemn, great hope. To God who is his home." Our Lord's parable of the foolish rich man has echoes of this psalm. "Whose shall those things be?" reminds us of "He will not take away any of it"; and "Soul, thou hast much goods laid up . . . take thine ease" is the best explanation of what the psalmist meant by "blessing his soul." The godless rich man of the psalm is a selfish and godless one. His condemnation lies not in his wealth, but in his absorption in it and reliance upon it, and in his cherishing the dream of perpetual enjoyment of it, or at least shunning the thought of its loss. Therefore, "when he dies, he goes to the generation of his fathers," who are conceived of as gathered in solemn assembly in that dark realm. "Generation" here implies, as it often does, moral similarity. It includes all the man's predecessors of like temper with himself. A sad company sitting there in the dark! Going to them is not identical with death nor with burial, but implies at least some rudimentary notion of companionship according to character, in that land of darkness. The darkness is the privation of all which deserves the name of light, whether it be joy or purity. Ver. 18 b is by some taken to be the psalmist's address to the rich man, and by others to be spoken to the disciple who had been bidden not to fear. In either case it brings in the thought of the popular applause which flatters success, and plays chorus to the prosperous man's own self-congratulations. Like ver. 13 b, it gibbets the servile admiration of such men, as indicating what the praisers would fain themselves be, and as a disclosure of that base readiness to worship the rising sun, which has for its other side contempt for the unfortunate who should receive pity and help. The refrain is slightly but significantly varied. Instead of "abides not," it reads "and has not understanding." The alteration in the Hebrew is very slight, the two verbs differing only by one letter, and the similarity in sound is no doubt the reason for the selection of the word. But the change brings out the limitations under which the first form of the refrain is true, and guards the whole teaching of the psalm from being taken to be launched at rich men as such. The illuminative addition in this second form shows that it is the abuse of riches, when they steal away that recognition of God and of man's mortality which underlies the psalmist's conception of understanding, that is doomed to destruction like the beasts that are put to silence. The two forms of the refrain are, then, precisely parallel to our Lord's two sayings, when He first declared that it was hard for a rich man to enter the kingdom of heaven, and then, in answer to His disciples' surprise, put His dictum in the more definite form, "How hard is it for them that trust in riches to enter into the kingdom!"